The original St. James Catholic Church in Mead was constructed in 1883. When a new church was constructed in Mead in 2002, the former church was moved to rural Waverly, where it is now part of an historical village at the Camp Creek Threshers site. For a detailed history of the parish and this church building, click here. Very few elements of the original church remain, though historical artifacts are continually being added by the Camp Creek Threshers. 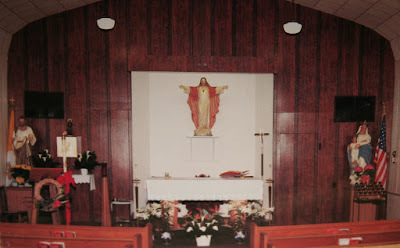 A photograph of the church interior as it appeared in the early 1990s.